With Camille Corot and Jean-François Millet, Théodore Rousseau (1812–67) ranks as one of the preeminent masters of the Barbizon School, a group of nineteenth-century French artists whose preferred subject was the primeval Forest of Fontainebleau. The Barbizon School painters were greatly influenced by the Romantic movement, producing works inspired by the powerful forces of nature. Surprisingly, despite his pivotal role in French art and his profound impact on the development of landscape painting, Rousseau has never before been the subject of a monographic exhibition in the United States. Composed of seventy works from private and public collections, including the Morgan Library & Museum, this exhibition considers the artist's wide-ranging achievements as a draftsman and his particular approach to the open-air oil sketch. 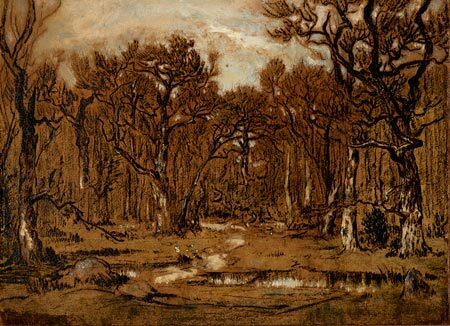 It traces Rousseau's path to Barbizon, from his early oil sketches in the Ile-de-France, Auvergne, and Normandy to his mature works in the Forest of Fontainebleau. Rousseau's works—some bucolic and evocative of a simpler, pre-industrial age, others brooding, moody, and redolent of Romanticism or testaments to the haunting majesty of the natural world—are both appealing and instructive. Collectively, this selection chronicles Rousseau's artistic practice and highlights his contribution to the shifting conception of landscape in the wake of the Industrial Revolution. The show explores the range of techniques and handling of media as well as the sense of poetic melancholy that permeates Rousseau's art. A fully illustrated scholarly catalogue accompanies the exhibition. This exhibition was made possible through the generosity of Karen B. Cohen, with additional support from the Estate of Alex Gordon and Mr. and Mrs. Clement C. Moore II. The catalogue was underwritten by the Franklin Jasper Walls Lecture Fund.